Great news for the Trump administration! WTF? 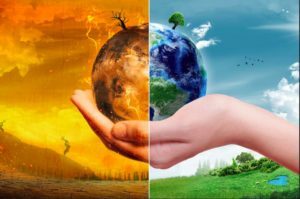 The Intergovernmental Panel on Climate Change (IPCC) has just issued its latest report on the increasingly dangerous impacts from climate change. It basically concludes that the planet is going to hell in the future, and that that future is closer than we ever imagined. While this has not been upbeat news for most of us, and a bit of a problem for future generations, it has been great news for the Trump administration. T-Rex and his minions had already decided that since global warming was getting so bad, we might just as well live as profligate as we want now. This is indeed the official position of the T-Rex administration in proposing to abandon President Obama’s auto mileage standards. One of their arguments is that the planet is going to warm by 4°C no matter what is done now. So if everybody continues to drive SUVs and Hummers and big trucks, that won’t change the destruction of the planet already set in motion. It seems they have abandoned climate denialism but adopted some bizarre form of nihilism. It’s a remarkable defense for ignoring any effort to mitigate the effects of GHG emissions. If one small step does not get us to where we are trying to go, then there’s no sense in taking that step, or any other steps. The only possible response to all of this is: WTF? (look it up). What pushed the T-Rex administration over this edge is likely the realization that to accomplish their destruction of environmental regulations they actually have to comply with the existing US laws, however inconvenient they may be. And many of those laws require them to justify, based on facts and science, any changes in existing regulations. They finally realised that there was no evidence that a court would accept that climate change was not happening. So they went in the opposite direction and adopted the most dire reports on climate change to justify doing nothing to inconvenience their followers. Bill McKibben argues that this argument is akin to saying that since you’re going to die eventually, there’s no reason not to smoke a carton of cigarettes a day. It’s worse. You’re welcome to kill yourself by smoking a carton of cigarettes a day but more likely than not you’ll also pass second hand smoke to others who you’ll also kill. That’s murder. Moreover, if the planet starts to warm up enough where it will interfere with the T-Rex crowd’s style of life, they will simply hire the most expensive consultants and direct them to devise a remedy to protect them and their life styles, no matter what the cost. It ‘s just about the money, stupid, to distort James Carville’s edict. As outrageous, cynical and vicious as this attitude is, especially for the most vulnerable people across the planet, lesser versions keep popping up. In a recent talk on trade unions and climate change a member of Germany’s media recently stated that Germany is responsible for only 2% of global greenhouse gas emissions so whatever it does isn’t going to make much of a difference in solving global warming. He added that of course Germany should nevertheless continue to do what it could. But this gratuitously converts Germany’s legal obligation on global warming to a charitable gesture, which of course can be ignored whenever that is convenient, as when things get economically tight in Germany. And the recent pullback from the Irish government on a carbon tax is explained away in part on the hypothetical rationale that other bigger players (e.g., T-Rex’s America) are laggards on climate change. So even if Ireland did all it could to reduce greenhouse gases (GHGs) that could hardly put a dent in the problem, or save the planet alone. So why bother the voting public. As we said earlier, WTF? Dam Vaughan, “Energy sector’s carbon emissions to grow for second year running,” The Guardian (8 Oct 2018).